If chocolate isn't the answer, the question doesn't matter. ← Happy birthing day, new website! We learned some new patterns then stopped to work on illustrated letters for a while. Teaching and learning comes in a variety of flavors. Whether I’m working in a classroom with twenty five students who were all born within eight months of each other, teaching to a small group of friends who’ve gathered in a clubhouse at their adult living community, or sitting with a single student, the process is essentially the same. I’ll share something that I’ve learned that you’ll enjoy and in your practice of the skill, technique, or project, I’ll learn from you. At its core, teaching is sharing knowledge. It’s a level of communication that we relish because it feeds our curiosity and our desire to know each other better. For artists, it’s much like peeling the layers of an onion. Each layer exposes another way to express creativity and each different media sparks new ideas for making marks on our world. I chose teaching early, and started practicing on dollies propped up in lawn chairs outside in the summertime before moving up to my first horn students when I was in high school. Skills honed in motherhood and scout troops for my daughters and their friends led to serious study of the art/craft/science of teaching. Through my years in education I’ve enjoyed a variety of settings and age groups – everything from kindergarten artists to sixth grade band students learning how to play their first musical instrument. Topics I’ve shared have included all traditional school content as well as special forays into mediation and conflict resolution, teaching adults how to shelter instruction for second language learners, and lots of fun side trips into topics of interest. Jenn's Craft-Savvy shop is a great setting for classes. Here, she works on a creation of her own. Practices like Zentangle seem to find us at just the right time in our lives. I have a thriving choice-based art classroom at school, a principal who supports professional development, and enough time and resources to travel from Washington to Massachusetts to add Zentangle’s certification to my bag of tricks. I’ve tucked Zentangle into the media offerings for my elementary students at school and have been amazed at the quality of children’s work with the techniques that Maria and Rick shared. 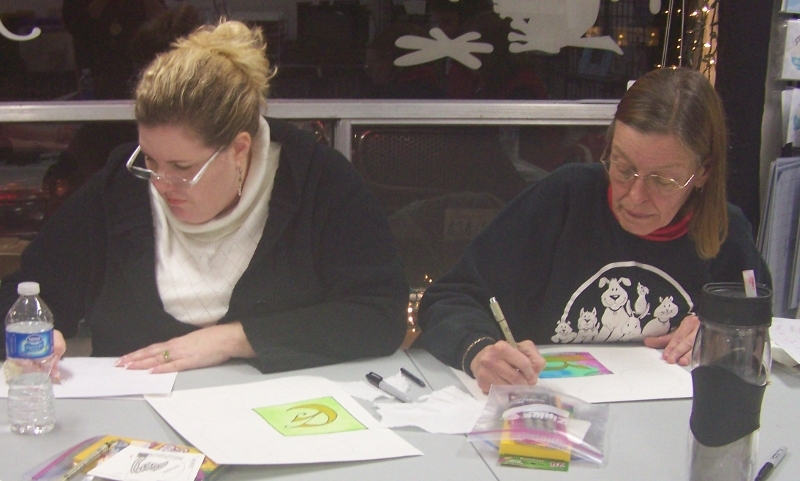 I also have a busy schedule of adult Zentangle classes, both with small groups in a variety of settings as well as with some enthusiastic students I met through Jennifer’s Craft-Savvy shop in Gig Harbor, WA. I love seeing how my students work with line and pattern. Art is a good nest for me. Dragons and Ginkgos and Chocolate, Oh, My! Happy birthing day, new website!